The physically demanding routines of every individual have made relaxation a necessity rather than a luxury. With industrialization and modernization, the baggage of physical conditions has also been seen. Chronic pain conditions and muscular problems are now commonly encountered owing to monotonous jobs. Talking about luxury we can say that the luxury of a massage has become quite normal in today’s world. And by this, we definitely do not mean hitting fancy spas. The same modernization has brought with itself technological marvels as well. An example of that is massage chairs. With every store being filled with a variety of massage chairs to choose from, it has become quite easy to get the body rejuvenated. In this review today we look at the various massage chairs by Panasonic and give you a good insight if you are planning on buying a massage chair. Innovation and professionalism come together to provide you with a personal masseuse at home with the Panasonic EP-MA73KU luxury heated massage chair. 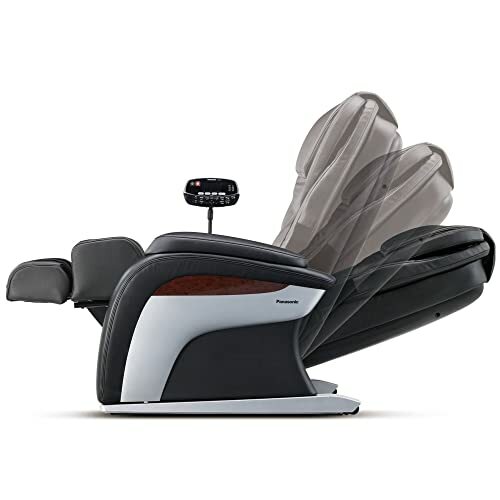 The unique quality of this massage chair is the ability to simulate a warm and customized spa-like massage. It does so by engulfing the whole body from head to toe in its multipurpose massagers providing relief from tense muscles. The EP-MA73KU has an inbuilt body scan technology which makes use of pressure sensors to create a virtual map of your body. This enables a customized and targeted massage which hits all the spastic and tense points of your body accurately. The massage rollers are equipped with multidirectional, double heated technology which runs all through the neck, back, shoulders, calves, hands, and feet. This provides a soothing and complete massage which relaxes the body by enhancing the circulation of blood through the muscles. To further compliment the intelligence of the massage rollers, a 3D massage system has been incorporated in the chair too. It enables the rollers to move up, down, left and right, so that the massage experience feels extra soothing. The 3D massage system not only does that, it also targets acupoints to relieve pain and spasm. This in combination with the thirty-three individual air cell system creates a perfect therapeutic massage by incorporating stretching techniques as well. This promotes increased flexibility and relieves tension from the neck all the way to the feet. The EP-MA73KU has ten soothing ultra knead Junetsu massage techniques which are 3D Neck Kneading, Neck Kneading, Side Neck Kneading, Shoulder Kneading, Upper Back Vertical Kneading, Upper Back High-Speed Kneading, Middle Back Kneading, Lower Back Vertical Kneading, Full Back Pressure Kneading and Waist Kneading. All the kneading massage techniques simulate the circular kneading thumb like motion used by a massage therapist to remedy tight and tense muscles. It has a customized palm and arm massaging feature which takes care of nasty knots in these areas and provides gentle relief. The EP-MA73KU has six automatic massage programs to choose from including Shiatsu, Deep, Swedish and Stretch. They can be chosen to target specific areas like the neck, shoulders, lower back or fullback. If you are not impressed with the automatic programs then you can always choose from the manual combination techniques. 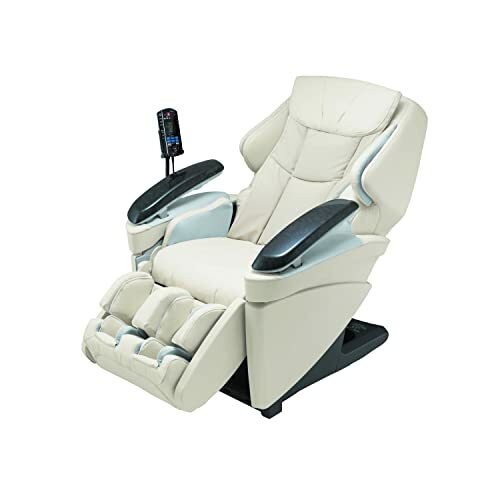 This massage chair brings you a whopping combination of 110 techniques which can be customized according to body area and massage technique. The manual massage techniques include features like Ultra knead, Knead, Shiatsu, Rolling and Swedish. This chair is a true definition of customization given the autonomy you enjoy according to your need and mood. 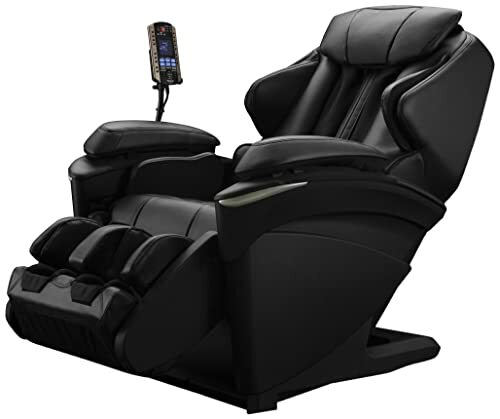 It also has a customized Shiatsu thermal, foot massager which provides a gentle and soothing foot massage. This massage chair comes with a tethered remote control which speaks true convenience. The automatic massage programs can be chosen with the touch of a button. The intensity and speed of the massage can also be controlled via the remote. The EP-MA73KU is as stylish as it is efficient. When not being used it can be folded back into a trendy armchair. It is quite portable and can be moved easily thanks to the rear wheels. This makes the chair easy to move to facilitate cleaning when required. We would definitely recommend buying this massage chair as it is an amalgamation of perfectly marvelous features. Although a bit difficult on the pocket, the EP-MA73KU is an amazing purchase. No audio features or speakers. Sore and aching muscles are taken care of with the Panasonic EP-MA70 Real Pro Ultra massage chair. 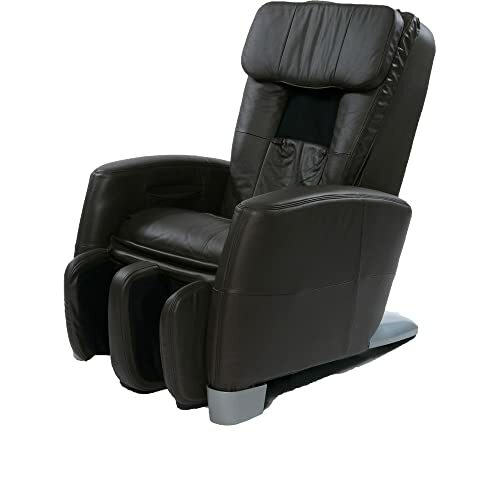 It is the ultimate massage lounger which relieves tight and tensed muscle. It comes with the body scan technology which makes use of precision pressure sensors. They intelligently detect the position and curvature of the body creating a virtual body map to enable the massage rollers to move in a direction that is customized according to your spine. The massage rollers are 3D and simulate a massage which is identical to the one provided by the hands of a professional therapist. The massage rollers are equipped to provide the relief of a hot-stone therapy which loosens tight and sore muscles. To add to this the massage rollers are heated. They are designed to move multi-directionally to provide stretch and relief which remedies sore muscles. The EP-MA70 also comes with an amazing air cell massage system which stretches, contracts and relaxes the muscles and provides flexibility by kneading them. It has six preset automatic programs to choose from. Each has its own custom massage therapy combined with a specific targeted area. Refresh provides a light, revitalizing massage, Deep gives a kneading and intense massage, and Shiatsu simulates a spa-like massage and relaxes sore muscles. The other three automatic massage programs are Hip, Neck/Shoulder and Lower back which provide an intense region specific massage. The manual massage program includes features like Ultra kneading, Shiatsu, Kneading, Swedish, Rolling, and Tapping. Each option provides a personalized, targeted and heated massage. The LCD remote controller has one-touch buttons for the automatic program selection. Depending on your mood and need you can customize your massage and choose from 108 manual massage combinations. This chair is a great space saver as it easily reclines into a stylish chair when not being used. Reclines into a stylish armchair. Enjoying an invigorating massage while staying in the budget can be achieved with the Panasonic EP-MA10KU Luxury Full Body massage chair. This amazing piece of machinery brings together Chinese and other traditional massage techniques together. The EP-MA10KU has an automatic height adjustment feature designed to deliver an efficient Chinese spinal massage. It has intelligent cervical spinal massage rollers which target painful points on the neck and back and relieve muscular tension by enhancing blood circulation. There are four automatic preset massage programs incorporated in this massage chair namely the Deep, Swedish, lower back and Neck/Shoulder. The most amazing out of these is the Neck/Shoulder program which simulates a Chinese cervical spinal massage. It pays special attention to the neck and shoulder muscles and also targets the pressure point for deep, soothing pain relief. The five precision manual massage programs are customized to provide a personalized massage. The neck shiatsu program rids the neck and shoulders of knots and tense areas. The Kneading feature targets and pressurizes the acupoints to promote energy flow. Further personalization of the kneading technique is made by focusing it on the neck in the Neck Knead feature. Rolling causes the massage pads to roll up and down the spine revitalizing the muscles in the spine. The tapping of a therapist’s hands is simulated by the Tapping massage program and provides gentle and soothing relief. Special attention is given to the lower body with the EP-MA10KU. It has an airbag circulation system to provide adequate stretch to the calves and the feet while enhancing blood flow through the legs. The built-in rear wheels of the EP-MA10KU make it highly convenient to move it around the house. The mobility makes it easy to clean the area in which it is kept. It can be turned into a stylish armchair by reclining when not being used and can add a chic statement to any décor. We would recommend this massage chair for anyone who wants a refreshing and revitalizing massage while staying in budget. Being approved by the American Chiropractic Association, the Swede-atsu Companion Massage Lounger brings together all the health benefits of a massage. It provides an incredibly soothing deep tissue massage which is extremely relaxing for the sore muscles. It has an in-built stretch system which is ideal for relieving tight and sore muscles and to stretch them for greater mobility. It has four preset programs namely Shiatsu, Swedish, Stretch, and Quick. All of these can be adjusted to five speed levels. There are eight manual modes such as Shiatsu, Compression, Firm, Hawaiian and Percussion and a total of eighty massage combinations which can be enjoyed. The massage rollers can be adjusted to provide targeted massages to the upper body, the lower body or the entire body. The two or four firm rubber massage heads simulate the motions of stroking, pressing and kneading just like human hands. It has a Dual-Use Ottoman system which provides a deep and revitalizing massage to the lower body. It is incorporated with an air system which gently squeezes the legs with a pressure which rises in twenty-degree increments. It also has the feature of height adjustment and delivers a massage in accordance with the position of the spine. It also has a neck roller which can be adjusted according to the user’s needs. Although easy on the pocket it does lack some of the essential features and should be bought only if financial restraints are severe.